inscription: In the center of the bottom border is "Jos. Mission Grafica 86." Poster with red, pink, green, and beige print on white paper. Image on bottom of poster depicts three human figures with skeletons visible, one is playing the saxophone, one is holding a hand full of paintbrushes over its head, and one is wearing eyeglasses and looking through a camcorder. 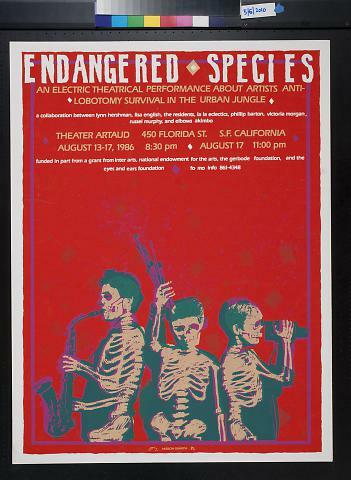 Text reads "Endangered Species / an electric theatrical performance about artists anti-lobotomy survival in the urban jungle...Theater Artaud 450 Florida St. S.F. California / August 13-17, 1986..." In the center of the bottom border is "Jos. Mission Grafica 86."